also be added to your order at checkout. 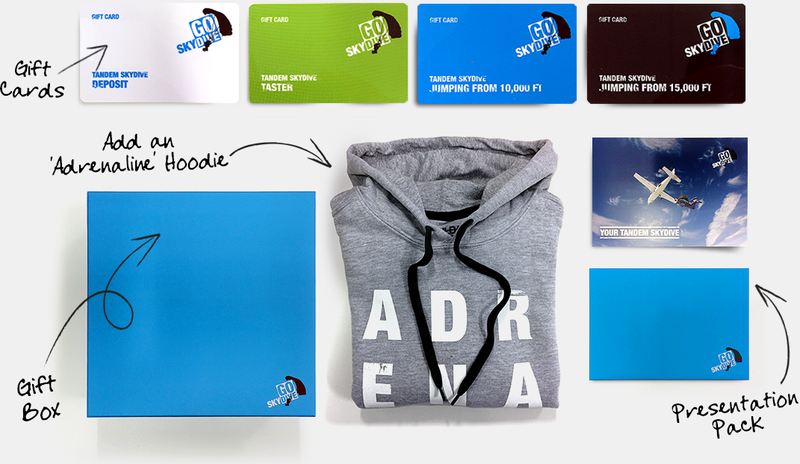 At the check-out select to have your gift experience in a presentation pack or with a gift box and hoodie. Short on time? Download an e-voucher at the check-out. This is the ultimate tandem skydive gift. The highest possible tandem jump altitude in the UK. A tandem skydive from 15,000ft means almost a full minute of freefall time, diving through the air at 125mph. There’s plenty of time to gather your senses and really understand what it is to skydive. For adrenaline junkies it doesn’t get better than this. This voucher is valid for 12 months. Jump days Thursday, Friday, Saturday and Sunday all year. Our most popular tandem skydive gift voucher and a great tandem skydive experience. This is a skydive from 10,000ft resulting in a 30 second ground rushing freefall experience. All tandem skydives include a magical 5 minute parachute ride across the Salisbury Plains where the awesome views include sites of prehistoric interest. Jump days Thursday, Friday, Saturday and Sunday all year. The perfect incentive to get someone skydiving – pay their deposit. This gives that someone the opportunity to book the 10,000ft or 15,000ft skydive within the next 12 months. You’ll have paid their £50 deposit so they’ll just need pay the remainder. A great introduction to Tandem Skydiving. The taster skydive gets you jumping from our lowest altitude of 7000ft. This gives you a 5-10 second taste of the high adrenaline freefall experience. The focus of this jump is very much the 5 minute tandem parachute ride. This amazing under canopy sky-ride is guided by the instructor who will manage the parachute and bring you into land. Taster Tandems take place on Thursdays and Fridays. This really is a ROCKSTAR of a package, a mega tandem skydive gift experience where literally everything is included! Not only will the recipient of this gift skydive from the highest possible jump altitude in the UK of 15,000ft, the whole experience will also be recorded by two cameras from two perspectives resulting in the production of two awesome videos and two lots of digital photographs. A GoPro is mounted to the tandem instructors wrist for the close-up perspective, recording the expression and emotion of the jumper both in freefall and under canopy. In addition a trained camera flyer will skydive alongside the jumper capturing the skydive in perspective with the plane and the fast approaching earth below. The highly skilled camera flyer will also engage with the jumper during freefall capturing these surreal interactions at 2-3 miles up. Plus the ROCKSTAR package comes gift boxed with an ADRENALINE hoodie. This is a fantastic combined experience that is only available with GoSkydive. Your experience will begin with a 20 minute trial flight over the historical Wiltshire countryside to the world heritage site of Stonehenge. As you return from the first part of your adventure get prepared for your experience to move from amazing to awesome as you then get set for your tandem skydive from 15,000ft with a full minute of freefall! An experience that puts your senses in to overdrive. Beyond exhilarating, it defies description and leaves you so ecstatic you want to scream out loud. 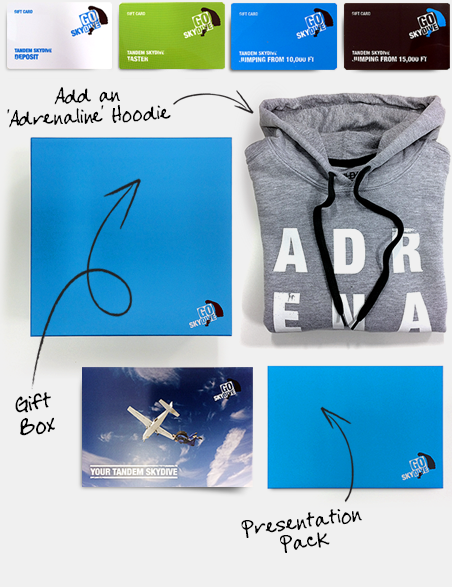 Buying a Tandem Skydive Gift Experience has never been easier. Just follow these four simple steps! Choose from one of the gift experiences above and then click ‘Buy Now’. Select how you want the gift experience to be packaged - either a presentation pack or an eVoucher. 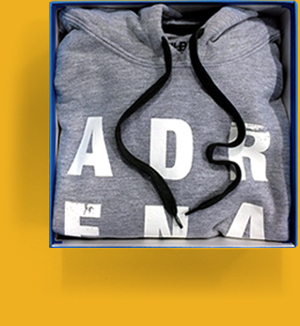 Add one of our NEW adrenaline hoodies. The gift experience will be sent to you to give to the gift recipient. The recipient calls us, quoting the voucher code and selects a date for their skydive. GoSkydive is the UK’s only specialist skydive centre for first-time jumpers. Our specialist team are trained to work specifically with first-time jumpers, guiding them through this amazing life experience. Don't take our word for it– check-out over 600 'Excellent' Trip Advisor reviews and the comments on our Facebook Page. GoSkydive have developed the world's first simulated training area for tandem skydive jumpers. Fully approved by the British Parachute Association this facility puts GoSkydive's safety development ahead of any other tandem skydiving centre. GoSkydive instructors are full time, British Parachute Association tandem masters. Tandem Skydiving is pretty much accessible to all, so long as you are over 16 and are relatively fit and healthy you can tandem skydive with us. We are first time jump specialists so you’ll need no prior training.